They had some theories about why this happened and some interviews with women who had been discouraged from entering the field, but I thought it might be worth getting the story from a woman who had actually gone into the field when all the women were supposedly getting out, like she didn't get the memo or something. I was able to find a woman who began a computer career in the early 1970s and actually returned to that career in 1984, a bit of an upstream swimmer, if you will. To protect her privacy, I will refer to this woman only as "Mom," because she is my mom. 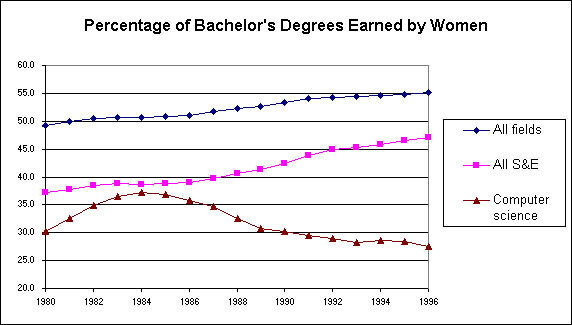 One important thing to note about that graph is that it is a graph of bachelor's degrees and not a graph of careers. Some people have suggested the turning point in the graph might actually reflect a reclassification of "computer science," saying that before 1984, data entry clerks and secretaries doing word processing were counted under "computer science," and the downward curve just represents a redefinition of the word to include only actual programmers and such. But it's a graph of bachelor's degrees, and you don't get a bachelor's degree to do word processing or operate a keypunch. I can tell you this because my mom was a keypunch operator. She did have a bachelor's degree, but it was in diplomacy, and she was finishing up her master's in special education. These are generally not considered computer science degrees. At the same time, she had a part-time job as a keypunch operator, which is the exact same mind-numbing job that data entry is today -- read a form, type the words onto a machine. The only difference is the typing made holes in a card that you put into a giant computer, which is very funny today and gives us a good laugh at how backwards people were in the '70s. Punch cards are the computer version of leisure suits. After graduating, I assume she burned her special ed degree and fired the ashes into space (I'm filling in the blanks here), and she started doing the keypunch job full time. One day, some people in suits burst into the keypunch room and announced that they were desperate for COBOL programmers (artist's reimagining). Computers were still pretty new, and schools hadn't been able to put out enough computer science graduates to fill the vast need out there. Desperate employers were grabbing people from wherever they could -- keypunch operators, clerks, maybe some homeless people -- administering a logic test, telling the top candidates, "You are a programmer now," and dropping them in front of a computer. My mom said she got the highest logic test score of all the applicants. I can't verify that, but she did get a job. With absolutely no programming experience, she had to learn COBOL pretty much by asking her co-workers for help line by line, making sure to rotate between different co-workers every day to avoid exhausting anyone's patience. Incredibly, this worked. She became an actual programmer. She moved on to get better jobs doing COBOL programming until some dumb baby derailed her promising career. Babies -- How Many Computer Careers Have They Ruined? One thing the Planet Money report didn't mention was babies, and how they destroy careers. Probably part of it is that nowadays, there's a lot more awareness of the whole work-family problem, and even though it hasn't been fixed, it's a thing people try to plan for. But things were different in 1976. My mom's cultural influences told her that the ultimate goal of a woman was to have kids and stay home and raise them. When I was born, she figured her career was done, and it was time to spend the rest of her life fulfilling her real purpose. This lasted six months. Apparently I was such a terrible baby that it only took my mom that long to realize being a stay-at-home mom wasn't her bag. She claims that it had nothing to do with me, that she loves me and my brother, and blah, blah, blah, she just thinks she wasn't cut out for the stay-at-home life. Whatever, like the world doesn't revolve around me. As if. "THIS IS ONLY THE BEGINNING! ALL WILL BURN!" The difference between then and now, is that nowadays, most women at least think about an exit strategy to get back to work when the kids are old enough. They try to keep up with their contacts, brush up their skills, and stay informed about the industry. But my mom didn't realize she was coming back. She knew early on that this stay-at-home thing wasn't the dream ending she was hoping for, but she also had this cultural pressure to just make it work. By the time she realized going back to work was a concrete thing she could actually do, she had lost all her programming skills and a lot of her English skills, too. I mean, you can totally have a baby and raise it, and go back to the workforce. I realize the baby thing is something people jump on when they want to argue women aren't as good as male employees, that baby leave ruins them. It doesn't. But if the woman starts her leave under the misconception that she can never come back, that's something that can screw a career. That's what my mom found when she applied for a job in 1984. She couldn't even prove she'd had three COBOL programming jobs in the past, because the companies no longer had records. Apparently in those days of paper records, it was a common policy to throw employee records out after seven years or so. My mom had been out of the field for eight years. Just her luck. On top of that, it would be an understatement to say that computers had changed quite a bit between 1976 and 1984. In any case, my mom couldn't get anyone to believe she had been a programmer before. Maybe it was because she was Chinese, maybe it was because she was a woman, or maybe it was because she kept talking about punch cards and vacuum tubes, I don't know. Fortunately, there was still a shortage of computer science graduates, because colleges weren't doing their jobs or something. So this one company my mom looked into started these three-month COBOL training programs that served as a hybrid of a class and a trial period, where you'd be hired on permanently if you did well. How did you qualify for the class? Another logic test, of course! My mom took the test, got into the class, and got the job. She stayed there 29 years, learned five programming languages, and was in charge of 50 programmers by the time she retired. She never got a computer science degree. In this kind of environment, why would anyone bother to get a degree? Seriously, walk in off the street, pass a logic test, and three months later, you're a programmer for life. 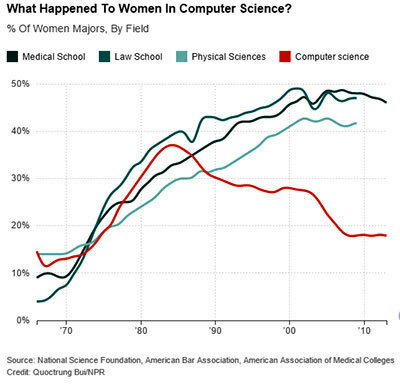 Here's another graph from a Stanford project on women in computer science that adds an interesting twist to the original one. 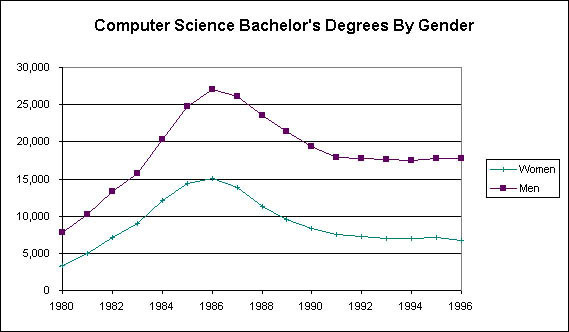 You see that same mid-80s decline in CS degrees for women, but interestingly, it follows the same pattern for men. It's not so much a direct indication of women being driven out of the field so much as possibly both men and women deciding this four-year CS degree thing is bulls**t when you can just dive in. I think this dovetails with the Planet Money piece's narrative of how pop culture started treating computers. They bring up movies about lone teenage (male) nerds becoming self-taught computer geniuses, and early computer ads that showed boys playing with computers at home. Add to that all the (exaggerated) stories of real-life computer guys dropping out of college and starting businesses in their garages. 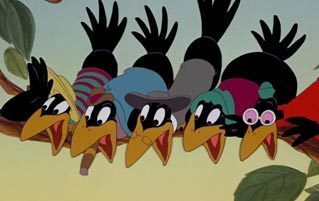 The only thing less believable than a successful megacorporation starting in a garage is a successful band starting in one. The common thread they point out is that these are all men, which is totally true, but the other common factor is that they're all self-taught and don't need some dumb college degree. Planet Money mentions that a lot of male CS students already knew a lot of the material in the classes by the time they arrived at college, and my college boyfriend said pretty much the same thing: that he just went to school to get "a piece of paper" basically confirming he knew what he knew. Maybe the difference was that by the mid-80s, computer skills weren't just something you learned in college, but a hobby you could learn on your own damn time. 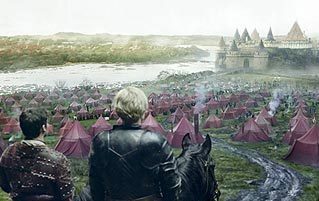 Some people got into the industry without even finishing college, but probably a lot more finished college with another degree, and just ended up putting their computer skills to use when that English lit major didn't pan out in the job market. My mom (diplomacy/special education) confirms this, both with her own example and looking at the programmers she's hired over the years. Planet Money points out that in this golden age of computer hobbying, American culture strongly implied that this hobbying was only for boys. They tell an anecdote of a sister who had to get the key from her brother every time she wanted to use the computer because it was locked in his room. There's also just general stories of parents bringing home computers for boys (and not so much for girls) because of this computer boy stereotype exemplified by Weird Science and WarGames and computer ads. "Learn to hack, and you can get an Ally Sheedy!" This early '80s Commodore ad features William Shatner! I actually feel like the ads have been getting worse since the '80s. I found a lot of '80s ads with girls and boys, and even entire families inexplicably gathered around a single computer, because they were somewhat disingenuously pushing computers as a "family activity" machine. 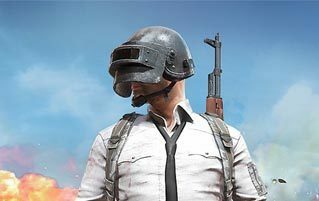 But over time, computer (and particularly video game) marketing has been getting more and more bro. I feel like my mom escaped this kind of cultural expectation because she was an immigrant. For her, "computers" just represented another field with a lot of open jobs for some reason. Obviously, she was pretty vulnerable to being influenced by cultural gender roles (like the stay-at-home mom thing), but her culture hadn't developed any roles about computers yet. For American women who were influenced by the new computer cultural roles, or more to the point, whose parents were influenced by culture, this meant they didn't get the head start on computers in their teen years like their male counterparts might have. And this is crippling in an era when a lot of computer skills are picked up through "hobby time" and not through formal schooling. So women were closing the gap in almost every male-dominated discipline, except computers. They weren't being driven out, but something was stopping them from coming in like they were everywhere else. While other degrees were moving rapidly toward (or above!) a 50-50 female-male split, CS was moving away if anything. Not in Chinese culture. Sure, traditional Chinese culture is as patriarchal as any other ancient culture, and although it contains the traditional value that women are primarily mothers, it also contains a powerful counterbalancing, cultural value best described as "money: get it any way you can." It's not as cynically materialistic as it sounds -- beneath it all, family comes first in Chinese tradition, but showing your loyalty to your family is done mainly through making money and providing for them. You do right by making bank. This value overrides any lesser cultural norms of "boy jobs" and "girl jobs." Any skepticism from Chinese parents about your choice of career tends to vanish if you show them a paycheck with enough zeroes. My mom objected to me being an animator, but stopped objecting when I became a well-paid animator. When I was little, my parents bought a TI-99/4A and told me to use it. How do you know when you've found "the one"? When Bill Cosby says you have. To them, it was not a boy's toy; it was a golden goose that would secure my financial future. They kept buying me computer books and sending me to computer classes even though I hated it. 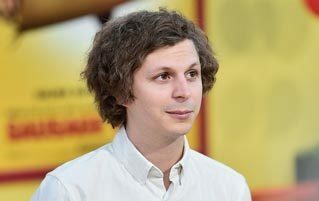 It's very ironic to think that there was some other girl out there at the same time that was itching to use the computer locked in her brother's room while her parents told her it was just for boys. My mom was not happy that I basically blew off this valuable computer legacy she was trying to give me, and I hope that at this point in the story, you can see why. Usually the strict parent that won't let the kid follow his/her dreams is an unsympathetic bad guy, but looking at what she struggled to achieve and pass on to me, you can see her point of view here, right? I sure couldn't at the time! I think what I find funniest about this whole thing is that there's an image of the kind of woman that breaks into male-dominated fields, especially in a particularly resistant time like the '70s. She's tough, maybe a little abrasive, doesn't take any nonsense, will go toe-to-toe with the boys playing pool or drinking or betting on football, and doesn't have any patience for girly girls. This is the kind of woman we imagine you have to be in order to succeed in a man's field. My mom, meanwhile, is a girly girl. She loves flowers, home decorating, hanging out at church, and gossiping. She'll drink half a bottle of beer (on special occasions) and put it back in the fridge for later. She spent my whole childhood trying to put me into dresses and yelling at me for being too manly. The daughter my mom wished she had. ADMIT IT, MOM. There are people who argue women aren't built for things like computer science and engineering because female brains are too emotional and don't do logic as well. A few women are good at computers, the reasoning goes, but only if they're special women with more masculine brains. I think my mom proves that wrong. She's got the most uncomfortably stereotypical "feminine" brain I've ever encountered, and she's an extremely sensitive, emotion-driven person with a lot of mood swings, who gets a little too excited about new health fads. She drives her more tomboyish daughter crazy at times, but she did the computers, and she did them quite well. I think the conventional wisdom, with its unquestioning acceptance of a connection between a personality trait and an aptitude for a certain kind of task, needs a second look. I think some well-meaning parents panic when their little girls want princess dresses and tutus and dolls, and want to ban these things because they think they'll stop them from becoming scientists or programmers or CEOs. Instead of trying to fix this problem by telling our daughters what they can't like, I think it might be better to work toward a society that accepts scientists, programmers, and CEOs that like unicorns and the color pink just as much as those that don't. "Emma, we need to take Mr. Sparkles away or you'll never succeed in technology." So here's what I've taken away from all this: I think computer science degrees have a lot of value today, but they don't make a good coder on their own. Most "computer people" gain as much, or more, of their expertise outside of formal education, and a lot of it probably comes before they even start college. And during that crucial time, we're still telling girls way too often that computers are for boys, and video games (a big catalyst for getting kids interested in programming, with mods and what) are for boys. Unless the girl's parents are Chinese immigrants or something. I think the way forward is clear. More parents need to become Chinese immigrants. Or we should keep trying to get more little girls into Minecraft or some s**t. I don't know, either way. Tell Christina why her mom should or shouldn't be disappointed in her on Twitter or Facebook. You can also give her messages to pass on to her mom, because her mom is ironically not good at the Internet. For more from Christina, check out 5 Weird Things That Apparently Make You Cool Now. And then check out 26 Comparisons That Will Destroy How You See History.